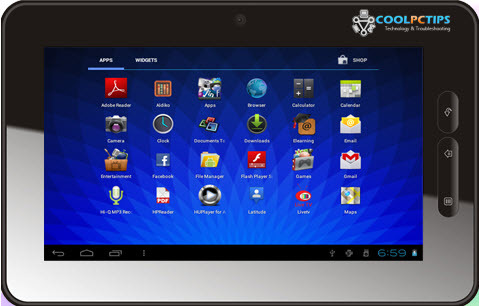 FunBook operating with Android 4.0.3 Ice Cream Sandwich is another cheaper tablet in the Indian tablet market, which is getting competitive day- by-day. Within the price bracket of Rs. 6,499, Micromax Funbook is powered by a 1.2GHz Cortex A8 processor combined with an ARM Mali GPU to handle the graphics. On the lines of HCL tablets, the Funbook also has an internal memory of 4GB and a 512MB of RAM. It also has other common features popular among tablet across the counter like a front facing VGA camera, 3G support (via USB dongle), HD video playback. It is supported by 2800 mAh battery, which doesn’t last longer under heavy usage. The Micromax is targeted for students from all age groups. Micromax has signed an agreement with Pearson and Universal tutors to provide educational content on its tablet. It includes over 500 courses on various educational topics. Funbook is a also very imperative device for fun lovers as well. It provides access to over 600 movies, 6000 songs and 4000 videos for its users. Along with Rs 6, 499 tablets, a free Tata Photon+ dongle with a limited data connection is provided with it. Funbook appears to be a more attractive choice than HCL’s recently launched tablets. The device is available in midnight black and slate grey colors. The tablet market has to make yet headway in India market, may be initiated by the tablets launched by Micromax and HCL. And at present, the real competition is with Aakash.